Do you like spending time with pets, particularly dogs? If you do, then dog walking could be the business for you. Get some fresh air and make some extra cash in the process. If you need more money but don’t want the time constraints of a second job, consider putting one of your interests to good use. Those who love animals can satisfy their passion as well as their wallet with a job as a dog walker. Dog walking is just that – exercising canines. Busy people who own pets don’t always have the time or energy to give their dog a full workout each day. As pack animals, dogs need that mental stimulation in order to adjust well to life with humans. A dog walker provides a much-needed service for busy pet owners. They spend time with the dog, give it exercise and also have some fun with it. You don’t need any special credentials to walk a dog. However, it is more effective if you are a dog owner who knows the habits of dogs and how to treat them. Doing a little research on canines doesn’t hurt when it comes to this job. 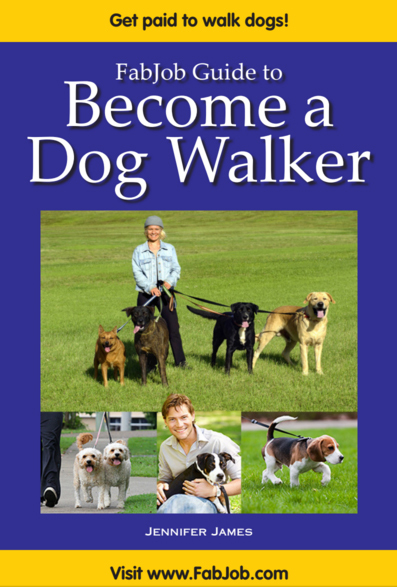 Consult your state or local licensing agency to see if you need a business license to walk dogs. If you do, fill out the requisite forms and file them before you begin. While you are waiting you can work on a plan to get started. If you own a dog, you are probably acquainted with others who do as well. Casually talk to them to see if they would be interested in hiring a dog walker (or know someone who is). Get a feel for the market for this service in your community and city at large. This will help you set your rates. Advertise your services. Free advertising is best, like word-of-mouth to friends or community bulletins. For a small investment, you can turn your car into a moving billboard with the name of your service and the phone number or email address to contact you. Prepare your gear. You could be walking more than one dog at a time, so make sure that you have extra leashes just in case one breaks. Plastic bags will be a must for outings with dogs, since most parks will require you to pick up after your pets. Create a schedule that works with your job and other commitments. Try to work it so that free time is filled with clients. Give yourself time to walk the dog and also time to arrive at your next client. Consider arranging appointments an hour or so apart. Your dog can help you earn extra money for your household. Try dog walking as a way to bring home more bacon. Is It Worth Paying for Access to Paid Survey Databases? What Does It Mean to Dropship Products? What’s Required to Be Able to Trade Forex? Do People Actually Get Paid for Opinions?